I'm Rick, retired, and the slave to a beautiful 6 mo Sun Conure named, Farlie. Unfortunately Farlie is sick right now and it's breaking my heart for he once was a very happy and active parrot. We've been together now for about a month or so and were bonding pretty well together, but now he's down and droopy and screams all the time. Doesn't play much anymore and obviously just doesn't feel very good. The antibiotics the vet has prescribed don't seem to be working and I just hate to administer them cuz I have to grab and hold him and jab a syringe down his mouth and he hates that. Why is he on antibiotics? You could try giving him the medicine on or in one of his favourite foods. Farlie may be reacting to being “grabbed” and having the medication force fed to him. Try to find a way to bribe him into taking the medication. Welcome to both you and Farlie. If Farlie likes sweet stuff try mixing his meds with what in the UK we call custard but my research tells me is called pudding in the US. It works for Casper, as does porridge (oatmeal). Casper takes his from a teaspoon but Farlie might need you to hold it for him. Oh yes, I do camouflage it in apple juice and mango juice. 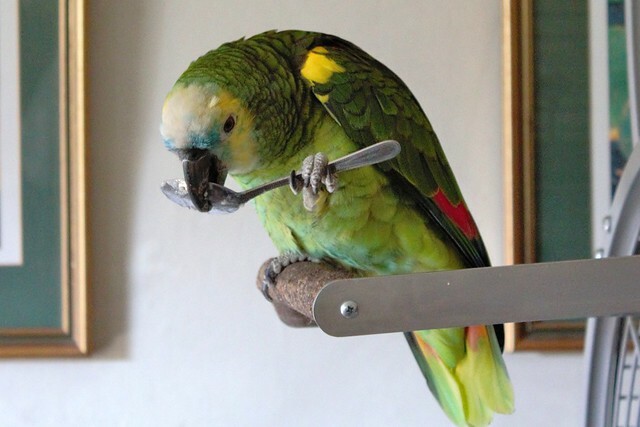 He won't take it off a spoon or any other way that I've tried. The problem is that we don't know each other all that well yet. I'm still new to him and still trying to bond. Unfortunately he got sick at the wrong time in our relationship, before complete trust was established. So, I'm struggling between being his best friend and the enemy with this medicine. We have a vet appointment Saturday at 8am so we'll know something then I hope. Last edited by Farlie; 11-02-2018 at 09:27 AM. Please let us know how he is doing after the vet visit. Hope he feels better soon. Boy, Farlie was a real stinker yesterday. He wouldn't stop screeching and these guys are loud. Even a neighbor mentioned it to me and that is not a good thing cuz it could cause one of us to get evicted. Last edited by Farlie; 11-02-2018 at 10:24 AM. Lol...yes, Suns are known for how loud they are. Thank goodness I have a Crimson bellied and a Peach front. Generally, they are both pretty quiet. Welcome Rick. I hope Farlie starts feeling better soon. Why did the vet put him on antibiotics? She thinks it's a respiratory infection cuz of his head bobbing. So far there has been no improvement with these meds. He just keeps sitting on a perch, fluffed up while bobbing his head up and down and screeching every 10 seconds or so, constantly. I've been covering his cage and turning out the lights to help 'calm' him down. Maybe tomorrow's 8am vet appointment will find more answers. Make sure you aren't using any unsuitable cleaning products, perfumed sprays or incense candles in the room. An air purifier is a worthwhile purchase, but not one that has an ioniser which can't be switched off. We use F10 to clean Casper's cage, it was recommended by our vet after we made Casper ill through our inexperience when he first came to live with us.